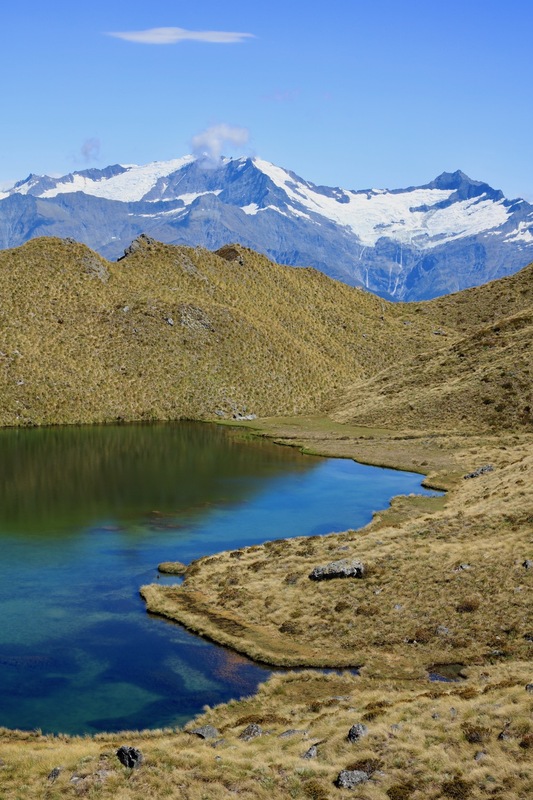 Words & Photography by Angela Terrell It’s immensely satisfying whiling away a week in Wanaka. Only an hour from Queenstown on New Zealand’s South Island and sitting on the shores of tranquil Lake Wanaka, this town merges arresting topography with holiday charm; its dramatic backdrop, the mountains of Mt Aspiring National Park, the perfect playground for an array of activities that would keep even the most demanding outdoor enthusiast content. During winter, nearby Cardrona and Treble Cone are ideal skiing destinations, but in summer, whether tramping, cycling, paragliding, kayaking, jet-boating or clinging precariously to a via ferrata, it’s a paradise for adventurers, photographers or those who find simply sitting and enjoying the serenity gratification enough. Any opportunity to leave the city behind and explore nature is welcome in my books, but it’s the mountains that elicit the most visceral response. I’m never sure if it’s their immensity or their harsh and unforgiving beauty that appeals to me most, but going heli-hiking with Eco Tours was a marvellous opportunity to lose myself in a mountain wonderland. Soaring along the braided river and over serrated ridge-lines we swung down sentinel-like outcrops to three lakes hidden within the folds of the alpine terrain and impossible to see until we were literally above them. This is real hiking with no marked trail, the tussock grass providing stability and necessary hand-holds as we traversed the steep mountainside. The views were magnificent though; razor sharp mountains as far as the eye could see, glaciers glistening under the scorching sun and lakes illuminated in rainbow hues; the emerald, aquamarine and turquoise rivalling any tropical oasis. 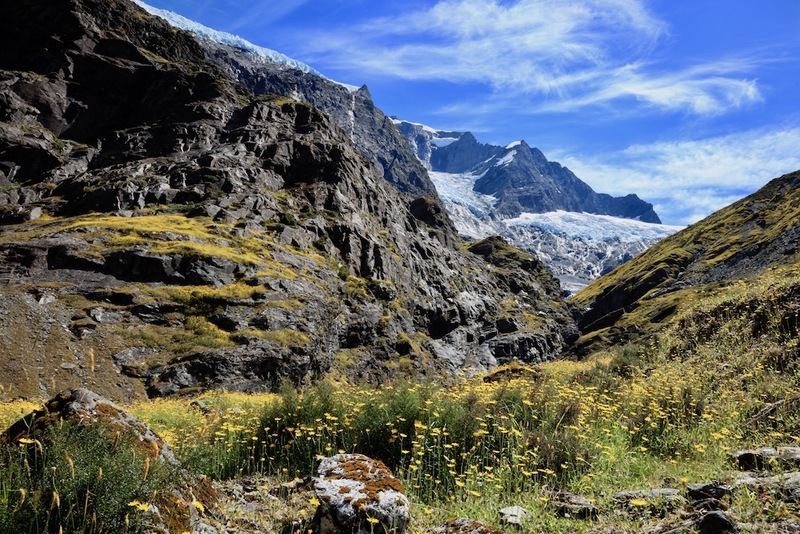 If helicopters aren’t your thing, the walk to Rob Roy Glacier is equally breath-taking. Starting from the carpark in the flats of the river valley you ascend (sharply at times) through cool verdant forest to the Upper Lookout sitting in a glacier-carved basin, the enveloping schist mountains softened by carpets of dandelions, terraces of cascading waterfalls and glaciers clinging to the mountain like buttery icing. Sitting by the torrenting stream it was hard not to feel a mild sense of unease; the wind rushing down its course ferociously loud and obviously reflecting the amount of water coming off its melting core, and I wondered what would happen if a wall of ice clinging precipitously to the mountain above carved off. In landscape this erratic and magnificent a sense of powerlessness is inevitable, although once reassured that the glacier was still a kilometre away (perspective is definitely a challenge in this environment) and any falling ice would remain in the arms of craggy gorges above, it was possible to enjoy the all-encompassing vista with a little more ease! Closer to home the Glendhu Track around Lake Wanaka is perfect for walking or cycling. Starting in town (after first organising a wonderful picnic from Big Fig - slow food served fast is their motto) what started as a relaxed ride became rock-hopping over knobby hillsides, the hairpin turns a reminder that any loss of concentration could result in falling into the water glistening like Christmas tinsel below. But around every corner was a panorama well worth assiduous pedalling. As weather is ever-changing in New Zealand, options for days where hiking wouldn’t be enjoyable is always advisable, driving to Blue Pools on the Haast road a great choice. Setting off on an inclement morning the scenery played a constant game of cat and mouse with the weather, moody clouds sheathing the mountains so they appeared as ghostly suggestions then breaking to allow bursts of sunlight that saturated hues and added to the dramatic landscape. Passing bucolic sheep-filled paddocks encased by craggy hills then Lake Hawea, the road hugging the shoreline like a velvet ribbon, we reached the Pools where walking through ferny undergrowth laced with skeletal tree-trunks we stood under moss-laden limbs of rainforest trees (the perfect umbrella) and admired water so clear it was possible to see trout languishing in its aquamarine depths. Of course there’s one activity that tops the lot and costs nothing, and that’s sitting by Wanaka’s lakeside as the sun slips below the mountain tops and the water changes chameleon-like from orange to pink then purple to eventually black as the day’s heat softens. Ducks share the shoreline with people frolicking in the shallows and picnickers chat as they enjoy delights such as fish and chips from Eric’s or pizza from Francesca’s food trucks. Not a mobile phone in sight, laughter floats across the ripples and the spectacle is better than any screensaver, its simple beauty ensuring an overwhelming sense of contentment. 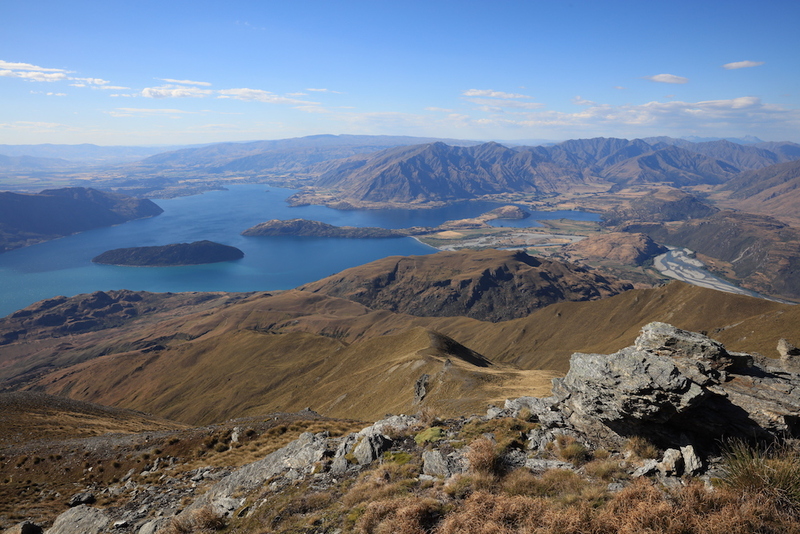 Whether whiling away a week or moseying a month, Wanaka is a delight for all.